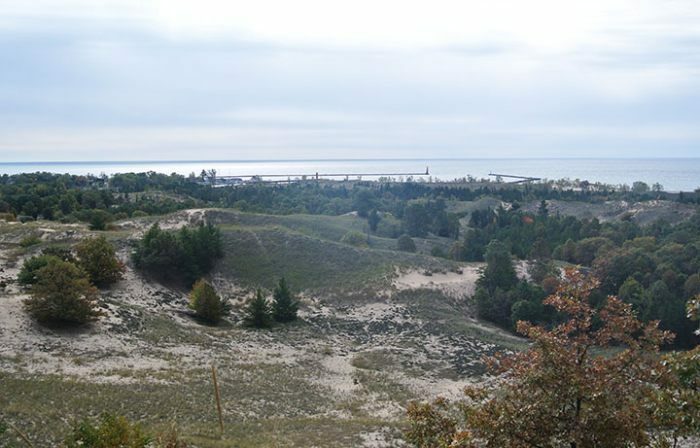 Often overshadowed by the hiking at P. J. Hoffmaster State Park, Muskegon State Park's 12-mile trail system is no less impressive than its better known sister park just to the south of it. This hike is a 4.2-mile loop combining two of the park’s most scenic foot paths; Dune Ridge Trail and Devil’s Kitchen Trail. 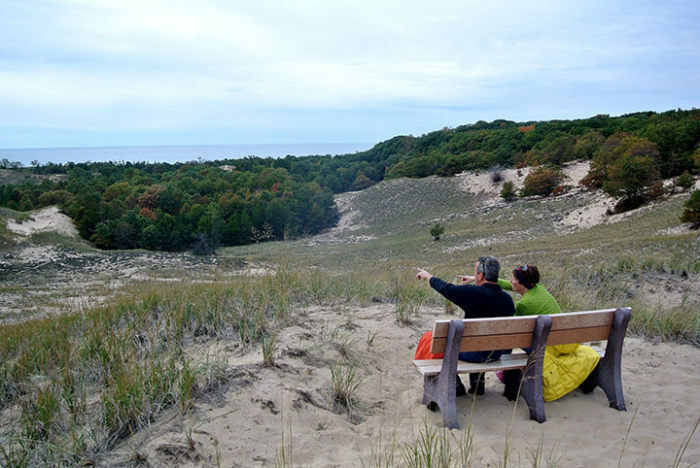 Located in the southern half of the park the two trails wind through a series of unique intracoastal dunes, a sea of shifting sand that lies between two large bodies of water: Lake Michigan and Muskegon. 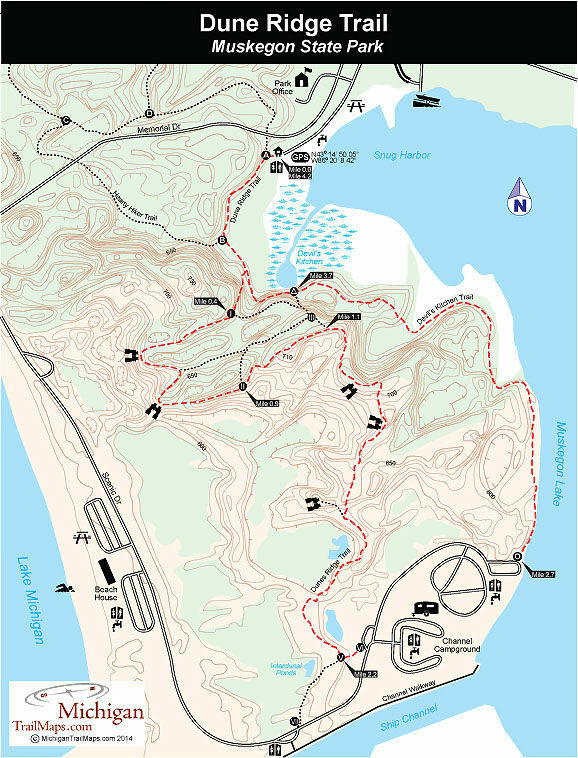 The trek is described from the trailhead in the Snug Harbor Day-use Area but can also be hiked beginning in Channel Campground or at post No. VII opposite a day-use parking area along the Ship Channel. Muskegon’s trail system is well marked with color-coded posts and at times the junction posts can be bit confusing as they labeled in Roman numerals and letters in the southern half of the park and numbers and letters in northern half. Add to the fact that the many spurs, loops and unofficial trails in the open dunes make it easy to get turned around and you have a place that requires a map in your daypack. 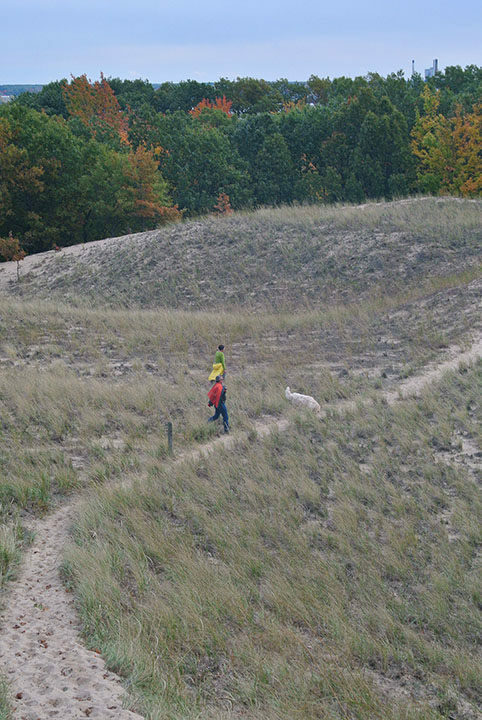 Like other dune areas, the hiking at Muskegon can be challenging. Steep climbs through the soft sand of a towering dune are common on this hike. If you arrive during the height of the summer, make sure you carry along a quart of water per person. At the west end of the Snug Harbor Day-use Area is a trailhead with a path leading into the woods that immediately arrives at post A. Head south (left) to follow the Dune Ridge Trail along a wide, level path that at one time was an old road around Snug Harbor. Within a quarter mile you reach post B, marking the junction where the Hearty Hiker Trail heads west (right) for post C. Continue south (left) and within 200 yards will arrive at a junction where the Devil’s Kitchen Trail veers off to the left for what is posted as “South Camp” (Channel Campground). Dune Ridge Trail heads to the right and you are immediately faced with a steep uphill climb along a soft sandy trail. You top off at a junction at Mile 0.4 that may or may be marked as post No. I. It’s been missing for years. Head west (right) and the climbing continues as you skirt the top of a dune ridge with a deep ravine on the south side. You descend a bit, pass a deep depression on the right and then climb a ridge to a scenic view of sand blowouts, often called sugar bowls, with Lake Michigan on the horizon. The next stretch follows the ridgeline and can be confusing due to all the social trails leading into the open dunes. Stay left and follow the ridge as the path swings east and then west, opening up to views of the Ship Channel between Muskegon Lake and Lake Michigan. The trail swings east again and begins a particularly scenic stretch. You hike along the crest of a high, ribbon-like dune where below you on one side is open sand and the other a forested hollow carpeted in last year’s leaves. Post No. II is reached at Mile 0.9. Continue east (right) at the trail makes a descent to skirt around a sandy bowl, followed by a knee-bending climb to the crest of another dune ridge. More views follow until you arrive at a junction at Mile 1.1 where a trail makes a sharp turn to the north (left) and the other trail continues following the edge of the open dunes (right). On park maps this is where post No. IV is labeled but the real post might be missing. Head right here and keep an eye out for directional posts as they will lead you off the ridge into the open dunes with a steady descent along a soft, sandy path. Within a quarter mile you reach a bench allowing you to sit and gaze at the open and wooded dunes stretching out to the west. You descend again and at Mile 1.5 you reach a second bench aliened in the same direction and overlooking Lake Michigan and the Muskegon South Pierhead Light. The trail continues in a southerly direction through an area laced with social path due to close proximity to Channel Campground. Keep an eye out for the directional posts, they seem to pop up just when you need one. At Mile 2.2 you reach post No. V, marking a spur that heads east (left) to post No. VI in Channel Campground. Within 100 yards you pop out of the trees at the post in a small trailhead parking area and then follow the campground road for a half mile to the third and final loop where post O, the start of the Devil’s Kitchen Trail, is located. Devil’s Kitchen Trail begins by tight roping a narrow strip between the shoreline of Muskegon Lake and a bluff of dunes to the west. At Mile 3 you leave the shoreline and swing sharply west, then north, passing the open fields that were once the site of Bay Mills Village, a native American settlement. Within a 0.3 mile the level walk ends as the trail climbs a wooded dune forested with an impressive stand of hemlocks and maples. Now a former road, the trail begins skirting above Devil’s Kitchen and reaches a post marked by a triangle at Mile 3.7. The short spur to the left steeply climbs to the crest of the dune, topping off at the Dune Ridge Trail neat post No. III. You head right for the best views of the marshy bay known as Devil’s Kitchen. The small bay forms the elongated end of Snug Harbor and is enclosed by high, forested ridges. When the conditions are right, the wind will rush in and swirl the rising mist off the water, making it look like the devil is boiling a wicked brew. This phenomenon occurs far more often in spring and fall than in summer. From Devil’s Kitchen, the trail descends the ridge and at Mile 4 arrives at post B. Head right and Post A and the Snug harbor parking area is only a quarter mile away. The Snug Harbor Day-use Area has a shelter, restrooms, drinking water and a boat launch. It is also conveniently located on the other side of Memorial Drive from the park office. A daily vehicle permit or annual state park pass is required to enter the park. From US-31, exit at M-120 and head southwest following park signs to Memorial Drive, which serves as the park’s south entrance and passes Snug Harbor Day-use Area. For more information contact Muskegon State Park (231-744-3480).